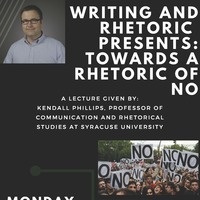 Kendall Phillips' research and teaching interests are in contemporary rhetorical theory and criticism. His work engages broad theoretical questions of advocacy, controversy, dissent, and public memory. He explores these concepts through a variety of rhetorical artifacts, including comic books, film, political speeches, and scientific controversies. Phillips is the author of "Testing Controversies: A Rhetoric of Educational Reform" and "Projected Fears: Horror Films and American Culture." He is the editor of "Framing Public Memory."